Paul Dry Books, an independent press in Philadelphia, kindly sent this book that I couldn't resist since it is set in the Puget Sound region and takes place in 1996, the year I moved to Washington state at the tender age of 21. Yearbook by Jesse Edward Johnson follows a small group of friends through their senior year of high school, focusing mostly on Lester Smith -- smart aleck, Milton fanatic, and Ramones addict. Lester is chock full of problems, the largest of which is that his father abandoned his family, and he takes many of his frustrations out on the young new AP Humanities teacher, Jeff Traversal. The only thing that he has any interest in at all during the school day is yearbook class. 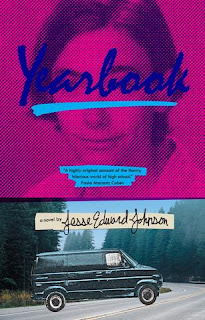 But when a tyrannical temporary principal threatens the quality of that bastion of high school memories, Les and friends must do some pretty daring things to rescue their legacy. Though there were a couple of far-fetched things that happened, for the most part this was a ridiculously accurate representation of life in the 90s as a wayward teen. This meant that there were times that I was completely frustrated with Les and his stubborn, wrong-headed decisions but I also intensely felt his reasoning (or lack thereof) for the things he chose to do. His relationship with his freshman sister was familiar (I had the same age spacing with one of my brothers) as were his few but close friendships. Overall, this is a coming-of-age story that has real heart and honesty and I'm glad it found its way to me. I graduated from a high school near Puget Sound in 1987, so this could be of relevance to me too (more my youngest sister's time though). I'm glad you found it worthwhile! I haven't read a book in a while that was so much about the day-to-day of high school and actual teacher interactions and such. It was strange because it brought back so many memories of my own!